Create a stunning hand-stamped card that will WOW and is mostly FREE! 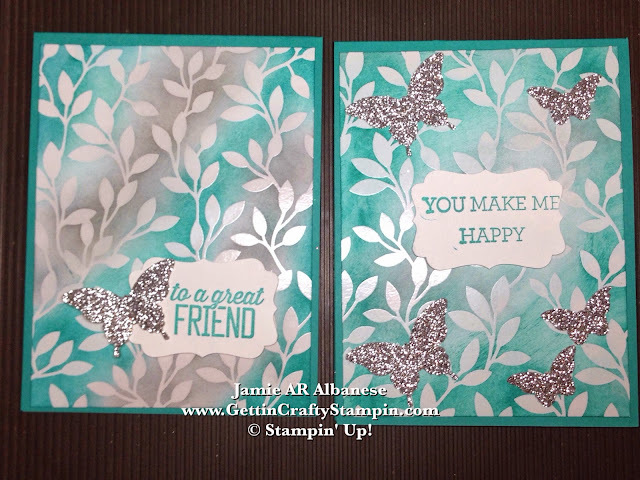 With this Stunning and FREE Irresistibly Yours Specialty Designer Series Paper and the Free Simply Wonderful stamp set and a simple use of our Stampin' Sponges this delightful card came to life. As a scuba diver, this card reminds me of the kelp beds with the beautiful colors and flow of the vines. The great thing is you can totally personalize this look with the colors that speak to you (and it's FREE!!) ! JOIN ME in sending card that will bless others while taking a little love from you to make a big blessing for others! My girlfriend, Gettin' Crafty Stampin' Stamper and Team Member Carol joined me to play with the new Irresistibly Yours FREE Specialty Designer Series Paper. Stunning for weddings and more - untouched - this White base with a clear embossed image across the top. Have FUN taking the paper to a WOW project! This was Carol's creation! 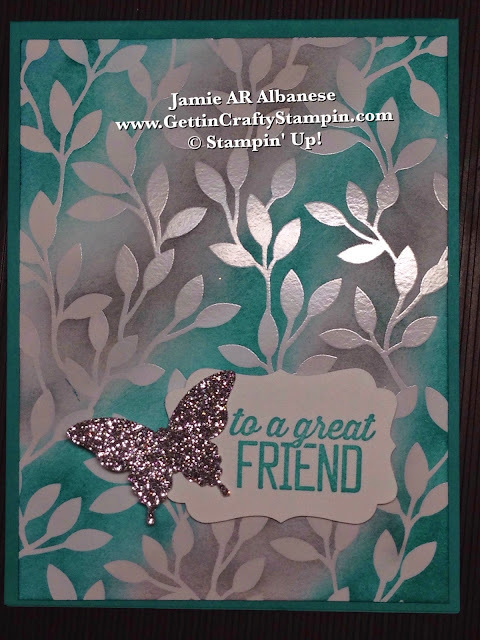 Using the Elegant Butterfly Punch and Silver Glimmer Paper to add sparkle to this pretty hand-crafted card! Rubber stamping the sentiment and using the Decorative Label Punch gives you a quick but pretty hand-stamped card. Happy Tool Tip Tuesday! I love our Stampin' Sponges!! So versatile, light weight and easy to use! Simply using our Stampin' Sponges to change the color of the paper, letting the white embossed/shiny image appear against the contrasting color. See the Video, below, on how easy it is to do! Not much is sweeter than a hand-stamped card sent to cheer or celebrate life with you! Well, make that a hand-crafted card made with stunning FREE Designer Series Paper and FREE Stamp Set that will WOW with a simple sponging technique (I Love FREEEEEEE!) 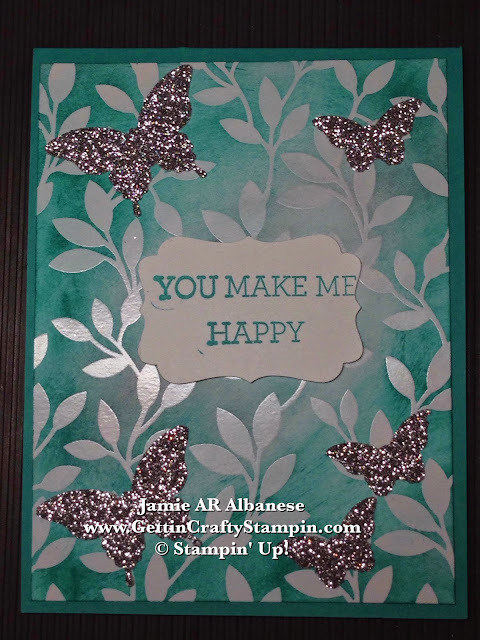 Taking the awesome Silver Glimmer Paper and our punches to create a dash of sparkle on this hand-crafted, sponged WOW card to show that you care and that someone adds sparkle and shine to your life! Send a hand-stamped card to those in your life, this small action will have a big blessing!